Pulling Apart Time and Finding Serenity: New Semester at Uni! Classes and Things! 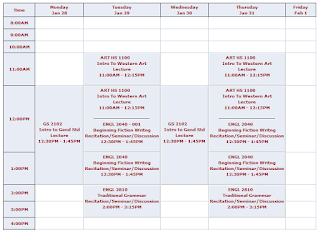 New Semester at Uni! Classes and Things! Just a small update! It has to do with school! So I started my second semester at Uni this week (on Tuesday the 22th, due to Martin Luther King Day on Monday). I am pretty excited for my classes and I seem to be okay with the homework. There is a lot of reading, due to the type of classes I am taking. 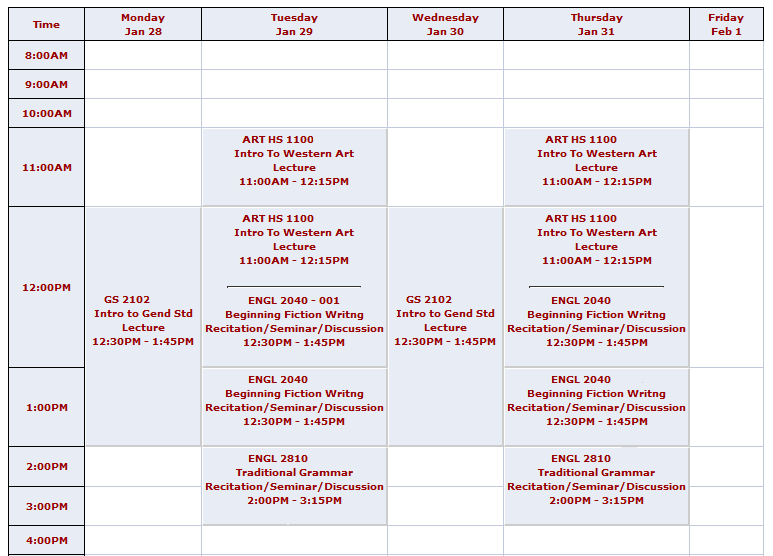 These are my classes for this semester. MW (That's Monday/Wednesday) I have one class at 12:30pm - Introduction to Gender Studies. It is a class that discusses gender (all five that are legally recognized, though there are more), women's rights, feminism, etc. It also talks about before the feminist movement. I believe we just got to the Tenth Doctor's regeneration... or just passed it. We haven't gotten to Donna yet, though. Another set of things I am currently craving are a spiked headband, gartered tights, and new extensions. I also want a pink curly wig to cosplay Reira from Nana. I got most of the outfit, except I can't figure out how to coordinate it. I am planning on wearing a mint shirt and jeans with black boots and a hat. And before I leave, I thought I would leave you with a song I have been addicted to (aside from DmC's soundtrack).